Late September and October is such a good time of year to fish on the Provo River. The temperature has cooled off, but the fishing is still hot. And for some reason, few people are on the water. But since this also coincides with the muzzleloader deer hunt and the general season elk hunt, I miss fishing most of this time. Jim and I fished before the deer hunt so I could get some fishing in and Jim also fished by himself. This time of year fly fishing is fairly predictable. 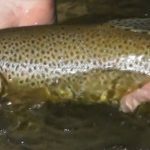 If it is a sunny day, there will be an afternoon PMD hatch and though there may not be much of a caddis hatch left, fish will hit caddis patterns in the evening. Also try swinging and stripping soft hackles and black ants as the light fades. 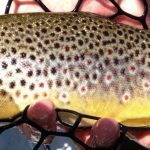 If it is a rainy/stormy day, the hatch may or may not happen but if it rains enough to muddy the water a little (mainly the lower part of the Middle Provo), the Provo River worms will be working. As predicted (sunny days), the fishing was fast and furious on top during the PMD hatch (noon – 3 p.m.), but you better have the right fly and you better fish it properly. The right fly is a very small (size 20-24) PMD or one of Phil Bair’s very small tan “No-seeums”. 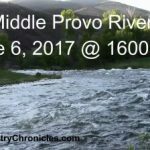 During the stormy day, fishing was epic and we did very well bouncing Provo River worms (watch video at bottom of post). Jim went to “Lunker” one day by himself. You know the spot; the “dry fly” side was occupied, so Jim fished the inside with a bounce rig. He hooked and played three big brown trout on PMD nymphs, but lost all three in the current. The folks on the opposite side were catching trout one after another during the PMD hatch (using “no-seeums”). 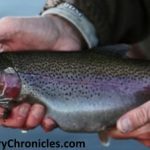 After the hatch, trout were taking cripple patterns under the water. Jim moved downstream into the shade to try skittering, but it was too early for fish to get very excited. So he put on his special soft hackle and had lots of action. While fishing, Jim ran into a fellow fisherman that has seen some of our videos. Jim fished with him and his buddy for a while and helped his friend catch his first trout on a fly rod. With the full moon out, the late night action on top is awesome. Folks are figuring this out. The last several years, Jim and I would fish until it was very dark (too dark to tie on hooks without a light). When we walked away from the river in the dark, we used to never saw another person. Now, when we leave we meet others that are still coming in. On the way out, Jim ran into two people just going in. They had head lamps and were rigging with big cone head flies, one said this would be his third night in a row. If you’ve never tried fishing in the light of the full moon, you’ve got to try it. Want to Fish with Jim & Dan? Want to try skittering in the dark? Click Here to Learn More.